The Golden Raspberry Awards, often shortened to the Razzies or GRA, is an award ceremony in recognition of the worst in film. Co-Founded by American copywriter and publicist John J. B. Wilson and Mo Murphy, the annual Razzie Awards ceremony in Los Angeles precedes the corresponding Academy Awards ceremony by one day. The term raspberry in the name is used in its irreverent sense, as in "blowing a raspberry". The awards themselves are in the form of a "golf ball-sized raspberry" which sits atop a Super 8 mm film reel, the whole of which is spray painted gold. The first Golden Raspberry Awards ceremony was held on March 31, 1981, at John J. B. Wilson's living room alcove in Los Angeles to honor the worst in film of the 1980 film season. The 36th ceremony was held on February 27, 2016. American copywriter and publicist John J. B. Wilson traditionally held potluck parties at his house in Los Angeles on the night of the Academy Awards. In 1981, after the 53rd Academy Awards had completed for the evening, Wilson invited friends to give random award presentations in his living room. Wilson decided to formalize the event, after watching a double feature of Can't Stop the Music and Xanadu. He gave them ballots to vote on worst in film. Wilson stood at a podium made of cardboard in a tacky tuxedo, with a foam ball attached to a broomstick as a fake microphone, and announced Can't Stop the Music as the first Golden Raspberry Award for Worst Picture. The impromptu ceremony was a success and the following week a press release about his event released by Wilson was picked up by a few local newspapers, including a mention in the Los Angeles Daily News with the headline: "Take These Envelopes, Please". Approximately three dozen people came to the 1st Golden Raspberry Awards. The 2nd Golden Raspberry Awards had double the attendance as the first and the 3rd awards ceremony had double this number. By the 4th Golden Raspberry Awards ceremony, CNN and two major wire services covered the event. 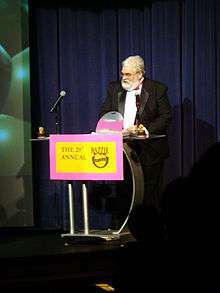 Wilson realized that by scheduling the Golden Raspberry Awards before the Academy Awards, the ceremony would get more press coverage: "We finally figured out you couldn't compete with the Oscars on Oscar night, but if you went the night before, when the press from all over the world are here and they are looking for something to do, it could well catch on," he said to BBC News. Most winners do not attend the ceremony to collect their awards. Notable exceptions include Tom Green (Worst Actor/Worst Director), Halle Berry and Sandra Bullock (Worst Actress), Michael Ferris, Joe Eszterhas (Worst Screenplay), and Paul Verhoeven (Worst Director). Two people won both the Razzies and Oscars the same weekend: Brian Helgeland in 1998 and Bullock in 2010, although both for different films. Neil Diamond was nominated for both a Golden Globe (Best Actor) and a Razzie (Worst Actor) for the same film, 1980's The Jazz Singer. Diamond won the Razzie, the inaugural Worst Actor Razzie Award. The Aerosmith song "I Don't Want to Miss a Thing", as part of the original soundtrack to the 1998 film Armageddon, was nominated for both an Academy Award for Best Original Song and a Golden Raspberry Award for Worst Original Song, as was the LeAnn Rimes song "How Do I Live" from the 1997 film Con Air. This award is given to a critical and financial failure that would've been nominated if it had received an eligible release. It was awarded in 2015 to United Passions. The Razzies have received criticism in recent years, including from news sources such as Indiewire and The Daily Telegraph, for several issues, including that members of the Golden Raspberry Foundation are not required to watch the nominated movies, and that seemingly anyone can join the Golden Raspberry Foundation, so long as they pay at least $40, which is different from the invitation-only Academy of Motion Picture Arts and Sciences. Critics take issue with the Razzies picking "easy targets" and mainstream films instead of those which are perceived as less popular but more deserving productions, continuing to appeal to celebrities, seemingly for publicity and attention, over other, worthier films and performances. Sam Adams of Indiewire has said the Razzies are "like hecklers hurling insults at comedians or a concertgoer yelling out 'Whoo!' during a quiet song, they're not-so-secretly crying out to be noticed. The Razzies, properly enough, avoid pouncing on the little guy; they don't trash no-budget indies no one has seen for having bad lighting or terrible sound". Robbie Collin of The Daily Telegraph has said "the Razzies' ongoing failure to train its sights on anything but the most obvious targets means it grows more tired and redundant by the year". CraveOnline's William Bibbiani stated that the Razzies follow "a cheap shot of pranksterism", and "with only a handful of exceptions, only seen fit to nominate the most infamous movies of the year, and not necessarily the worst." 1 2 3 4 5 6 Lindrea, Victoria (February 25, 2007). "Blowing raspberries at Tinseltown". BBC News. BBC. Retrieved 2009-05-04. 1 2 Larsen, Peter (January 20, 2005). "The Morning Read – So bad, they're almost good – A love of movies lies behind the Razzies". The Orange County Register. p. 1. 1 2 3 Germain, David (Associated Press) (February 26, 2005). "25 Years of Razzing Hollywood's Stinkers". South Florida Sun-Sentinel. Sun-Sentinel Company. p. 7D. 1 2 3 4 Marder, Jenny (February 26, 2005). "Razzin' The Dregs of Hollywood Dreck – Film: Cerritos' John Wilson Marks His Golden Raspberry Awards' 25th Year With A Guide To Cinematic Slumming". Long Beach Press-Telegram. p. A1. 1 2 Dawson, Jim (2006). Blame it on the dog: a modern history of the fart. Ten Speed Press. pp. 48–50. ISBN 1-58008-751-5. ↑ Crouse, Richard (2005). Reel Winners: Movie Award Trivia. Dundurn Press Ltd. pp. 103, 208. ISBN 1-55002-574-0. 1 2 Marrs, John (February 25, 2009). "'They have no excuse to be as bad as they are' – The Golden Raspberry awards aren't just a refreshing antidote to the Oscars, they can help sell films too. John Marrs talks to the Razzies' founder, John Wilson". The Guardian. Retrieved 2009-05-06. ↑ Margulies, Lee (February 21, 2009). "Film Industry Razzes 'Love Guru,' Paris Hilton". Los Angeles Times. ↑ Telegraph Herald staff (February 22, 2009). "Hilton, Myers top Razzies". Telegraph Herald. p. A2. 1 2 Bushby, Helen (February 27, 2005). "Berry gets worst actress Razzie". BBC News. BBC. Retrieved 2009-01-19. ↑ Chris Tookey (February 21, 2011). "Over-priced, over-hyped – and they even make you feel ill. Are 3-D films the biggest rip-off in cinema history?". Daily Mail. Retrieved 2011-02-27. ↑ "M Night Shyamalan's Last Airbender wins Razzie Awards". BBC News. February 27, 2011. Retrieved 2011-02-27. ↑ John Wilson (January 21, 2009). "Razzies 2008 Nominees for Worst Career Achievement". Retrieved 2009-01-22. 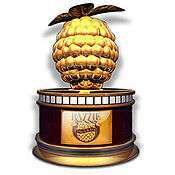 ↑ "Razzies.com - Home of the Golden Raspberry Award Foundation". razzies.com. 1 2 3 4 5 Sam Adams (5 January 2015). "Why the Razzies Are the Worst Awards Ever". Criticwire. 1 2 "Why I hate the Razzies". Telegraph.co.uk. 1 March 2016. ↑ "HOW TO BECOME A MEMBER". Oscars.org - Academy of Motion Picture Arts and Sciences. 1 2 "Which Easy Targets Did The Razzies Pick This Year? - CraveOnline". 13 January 2016. Retrieved 31 October 2016.